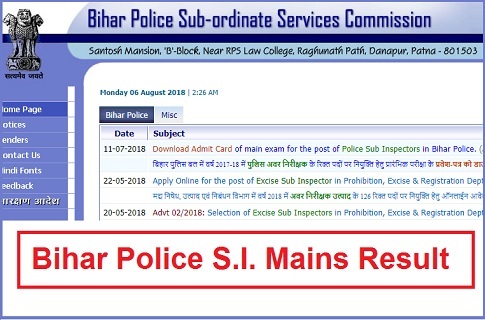 Bihar SI Exam (Mains) Result 2018: Bihar Police Sub-ordinate Services Commission (BPSSC) has declared the results for the written examination (Mains) for 1717 vacancies for the post of Police Sub-Inspector (Daroga) in Bihar Police. Mains examination was held on 22 July 2018 in Patna. Candidates can check their result on the official website of BPSSC : http://www.bpssc.bih.nic.in/. Total 10,161 candidates have qualified in the Mains written exam. Qualified candidates will appear for physical efficiency test(Race, Long Jump, High Jump, Gola Fenk) which will be held in next month.